Writing Excuses is a podcast. This website says “Writing Excuses” all over it, and is made of mostly text, yes, but in truth Writing Excuses is an audio thing. It’s for listening to! 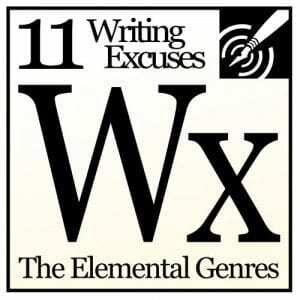 Writing Excuses is a fast-paced, educational podcast for writers, by writers. It airs weekly, with new episodes appearing each Sunday evening at around 6pm Eastern Time. Episodes vary in length from fifteen to twenty-five minutes, but are usually less than twenty minutes long. The tagline, “Fifteen minutes long, because you’re in a hurry, and we’re not that smart” isn’t super accurate, time-wise, but it’s a haiku so we’re keeping it. Our goal is to help our listeners become better writers. Whether they write for fun or for profit, whether they’re new to the domain or old hands, Writing Excuses has something to offer. We love to write, and our listeners do, too. Writing Excuses was created in 2008 under the direction of Jordan Sanderson, with Brandon, Dan, and Howard. They recorded five “seasons” of twenty-five to thirty episodes each. Mary joined the cast in 2011, kicking off Season 6. 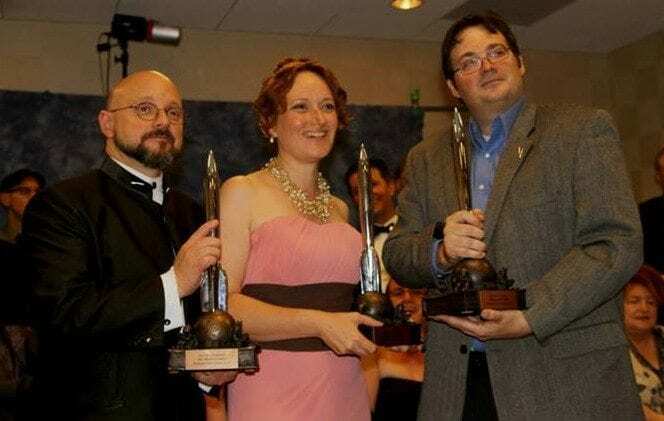 Their first full-year season together, 2012’s Season 7, won the 2013 Hugo Award for Best Related Work. Wesley Chu, Piper J. Drake, and Mary Anne Mohanraj joined the cast for Season 12 in 2017. Maurice Broaddus, Amal El-Mohtar, and Valynne E. Maetani joined for Season 13 in 2018. Calendar-year seasons have been the Writing Excuses standard since 2012. Six of these 52- or 53-episode seasons (seasons 7 through 11) aired from 2012 through 2017, and Season 13 is airing during 2018. In 2015 the Writing Excuses team celebrated their tenth season by introducing a season-long theme. For Season 10, the hosts arranged the entire year of podcasts to flow like a single, multi-session master-class designed to walk a writer through the process of creating a story. Listeners liked it, so Brandon, Dan, Mary, and Howard set out to do it again in 2016. Season 11, The Elemental Genres, was organized around genre-like elements (sci-fi, romance, comedy, etc) that can be combined and deployed independently of “bookshelf” genres, with an eye toward fully understanding why we’re adding rocket ships, buddy-cops, or quirky footnotes to the stories we tell. Season 12 was simply titled “Structure,” which does a small disservice to the fascinating and useful material we drilled into. We covered viewpoint, prose, plotting, outlining, and much more, and with a much broader range of expertise than we were able to in past seasons, thanks to the expert help of our 2017 hosts Mary Anne, Piper, and Wes.